Another month, another theme! For October, I’ve decided to do a Global Traveler theme because I’m (finally) taking my long vacation this month. I don’t get a lot of vacation days, so every year, I hoard them and plan out months in advance how long my trips can be to maximize the amount of time I get to go out and travel. Like many people my age, I love traveling. I really enjoy exploring new cities and visiting places with new people, being a quintessential tourist and eating all of the food I can get my hands on. I like seeing the sights and sitting quietly in some corner, trying to sketch out what I see in front of me quickly before my hands freeze or my legs fall asleep. My trips are always planned out way in advance, with spreadsheets and Google Maps lists of where I’d like to visit, and when I get there my plans inevitably fly out the window as my breath gets taken away by the beauty before me. So, if you haven’t guessed it yet, my SO and I are traveling to France this month! We’re going in the middle of October, hopefully just before the weather begins to get too cold and the days get too short. 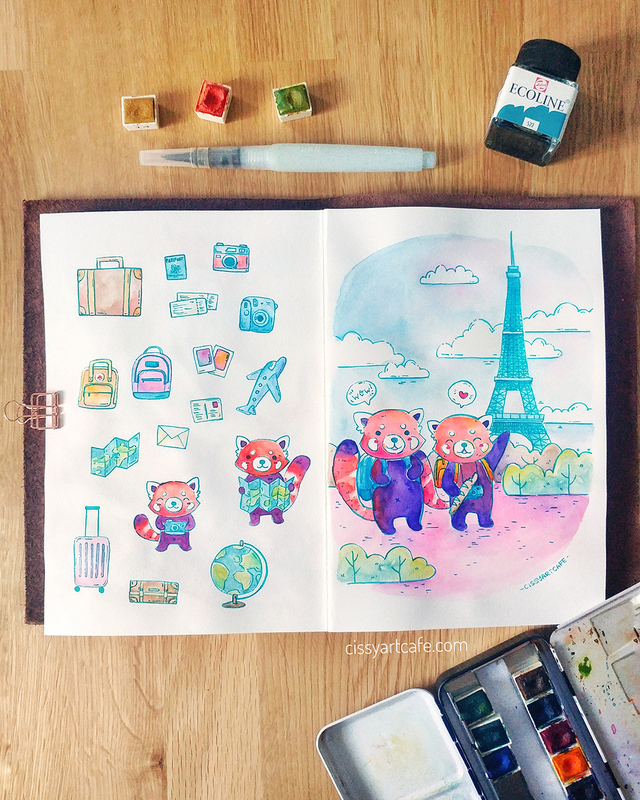 I’m definitely planning on painting a lot and taking a lot of footage, so hopefully I’ll have a cute little travel vlog to help me commemorate the trip at the end of it! I decided to paint us as red pandas because we both love the animal for their playful nature and, honestly, I thought it would look cute. I think it adds to the whimsical nature of the painting, don’t you? Just a little update from my previous few bullet journal blog posts, my setup has not really changed! Does this mean I’ve found planner peace? I suppose time will tell, but for now, this method has been working really well for me. I’m still loving this simple monthly overview. It’s basically the original version from the bullet journal website in a 2 column format. Since I don’t usually have a ton of events planned far in advance, I don’t need a huge calendar to fit everything! I just use it as a small reminder of big things happening over the month. I’ve also been enjoying a little monthly to-do and project list. These have been keeping me accountable and making sure that I move towards my bigger goals. I haven’t planned exactly what’s going in those columns yet for October, but “packing” is sure to show up in the to-do section, and Christmas presents are almost certainly going to be in the projects section. Across from the overview page, I keep a gratitude log. Gratitude logs are really beneficial for someone like me, who deals with quite a bit of anxiety. It helps ground me. Coming up with one little thing every day reminds me that there is always something lovely to be grateful for. Other little tidbits I have in my overview spread: A mailing list tracker (have you signed up for my happy mail yet? I don’t spam! ), an Instagram tracker, and a sales tracker. I like to see my progress over the month! For the painting, I used my Prima Watercolors Tropical Confections palette on Canson Mixed Media paper. I did change it up for one thing though. I used a new Ecoline Liquid Watercolor for the linework instead of my usual red watercolor paint! The one I used is 522 Turquoise Blue. Working with it is a little different than with solid watercolor paint, so I had to figure it out and adjust on the fly. In my journal, I’m still using my beloved TWSBI Eco. She is my true love in the form of a fountain pen, and, if you’re a long-time reader of this blog, you’ll know I have her paired permanently with Noodler’s Lexington Gray ink. I switched out the highlight color to Tombow 620 Dual Brush Pen, which is a pretty lilac color. I love how it looks with the theme and with the gray ink! As usual, I am offering the same printables I used for you to purchase in my shop! All of my calendars are customizable for your needs. If you’d like me to switch out the month I can do that for you for free. 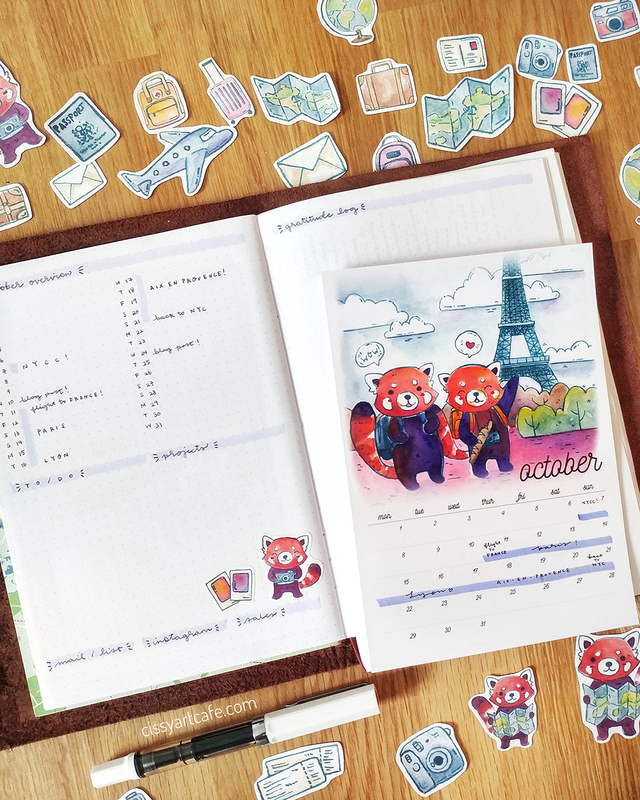 I also have planner stickers available. They are formatted so that they’re all within 1.5″ wide, so they should fit beautifully in almost any planner you might have. I have the same cover painting available as a print and as a greeting card, because I thought the illustration was too cute to pass up! 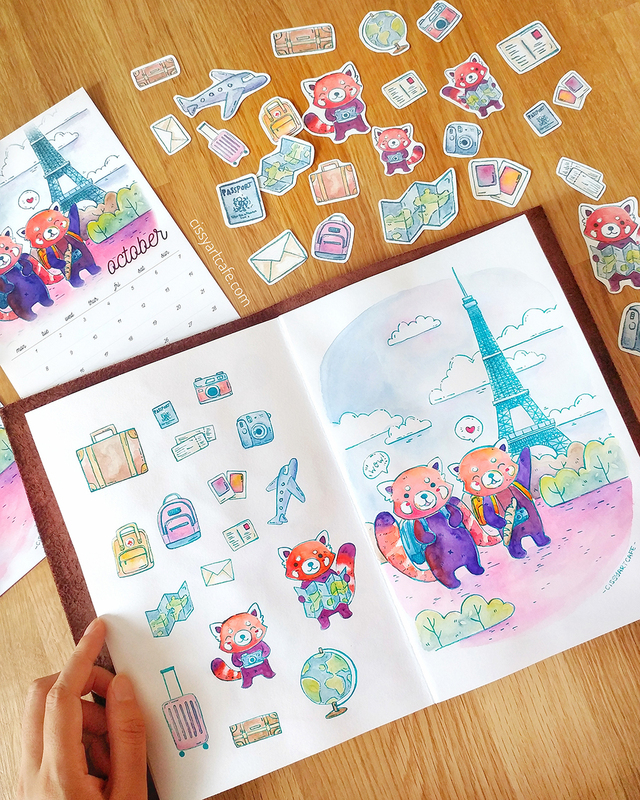 I am so happy with how the paintings and the setup turned out, and I hope you love the stickers and printables as much as I do! 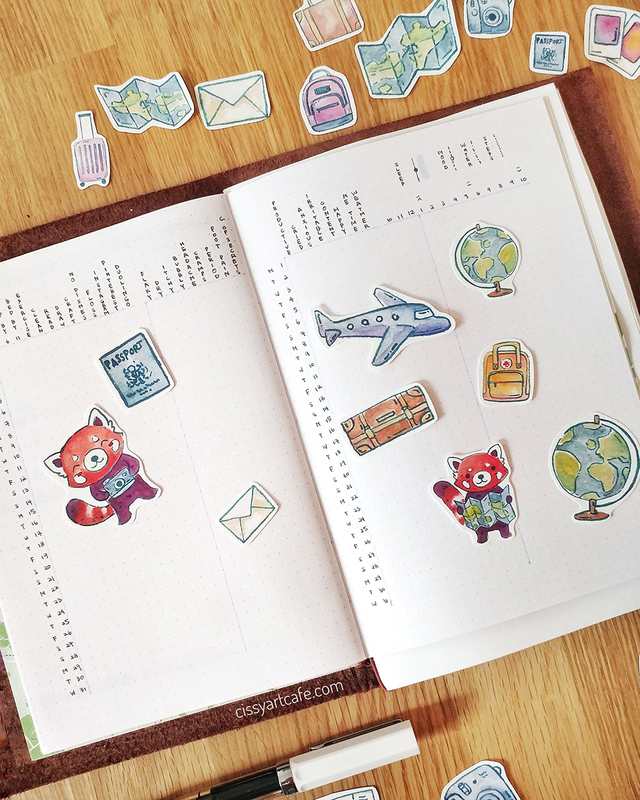 I can’t wait to use my stickers in my spreads this month. As you can tell, I’m very excited about my trip to France that I have planned. We are going to Paris, Lyon, and Aix-en-Provence. I am very ready to eat at least one baguette a day (if not more)! What is your favorite thing about traveling? I’d love to know!